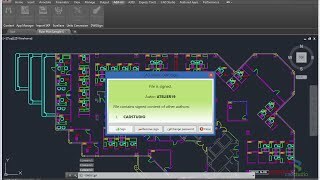 CADstudio DWGsign is an add-on utility for Autodesk® AutoCAD® which watermarks your DWG drawing document (project, block or template) with a permanent invisible signature containing your or your company's name. This add-on tool helps to protect your intellectual property (IP) as you can prove the ownership of the original content in any future DWG files which are based on this signed document. Your original signature can be also viewed/verified using the free DWGsign Reader application. If you sign your company template (.DWT), all new drawings based on this template will be automatically "signed" (watermarked).